A visit of President Joachim Gauck, Foreign Minister Frank-Walter Steinmeier and the IB Refugee Home in Berlin-Marienfelde were part of the Elders program under the leadership of Kofi Annan from 12-13 September 2016. The former UN Secretary General is the chairman of theo rganization “The Elders” founded by Nelson Mandela in 2007. The Association campaigns for peace and human rights worldwide. 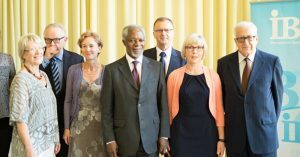 On his first trip to Germany Annan was accompanied by the former UN peacekeeping diplomats Martti Ahtisaari and Lakhdar Brahimi. In Berlin Annan called on to impassionedly promote an open society and to justify the decision to welcome the refugees in Germany and Europe. “I am convinced that most people’s heart is in the right place,” Annan said. “The reasonable people are not yet enough standing up against the xenophobes”, said the former UN secretary general. the reasons that provoked the current 700 residents to flee from their home countries, how they experienced their arrival in Germany, and how they imagine their future. Amongst others, the refugees reported that it is difficult for them to get a flat and some of them therefore for years had to live in transitional homes for refugees. Kofi Annan underlined in the two-hour interview, that learning the local language and to participate in employment projects are important prerequisites for integration in the host country. the Berlin Wall in 1989, it served as a focal point and transitional home for Germans from the GDR who sought a new home in the western part of the country that was still divided. Chechnya, Serbia, Bosnia, Iraq and Sudan as well as many stateless refugees. Kofi Annan on Tuesday praised the work of the IB in Berlin-Marienfelde and thanked all volunteers and professionals for their efforts.